Welcome to the largest event in the Marvel Cinematic Universe. Before we dive in, here are the 18 films you need to see in order to completely understand what the hell is going on, and yes 18 is a large number of films. Iron Man 1, Iron Man 2, Iron Man 3, The Incredible Hulk, Thor, Thor Dark World, Thor Ragnarok, Captain American First Avenger, Captain American Winter Soldier, Captain America Civil War, Avengers, Avengers Age of Ultron, Guardians of the Galaxy 1, Guardians of the Galaxy 2, Ant-Man, Doctor Strange, Spider-Man, Black Panther; holy cow. Not every one has a ton of impact on Infinity War, but you get the drift, and if you're excited to see this movie you've probably seen most of its predecessors along the way already. This latest addition to the 'Verse is by far the most audacious and the most engrossing (not to mention grossing), and fans will not be disappointed when they leave the theatre three hours after they entered. To summarize, the Avengers are scattered. Iron Man and Captain America broke up, Thor and Hulk are in outer space, Wanda and Vision are having a little Scottish holiday, the Guardians are cruising about, T'Challa is nursing Bucky back to health, Stephen Strange is protecting New York, and Spidey is still as cute as a button. Ant-Man, Wasp, and Hawkeye are on leave, so don't expect them, but everyone else you've ever heard of is hanging around and will be ready when trouble comes, and it's coming. Thanos, the villainous Titan, has procured an Infinity Gauntlet, he's on a hunt for the six Infinity Stones, and when he succeeds he plans to wipe out exactly half of the universal population in the blink of an eye. Not good, but luckily we have an entire, giant team of heroes ready to save the day. That is, if they can work together, if they can protect the Stones they know about, and if they can somehow figure out how to stop the galaxy's most evil and definitely most powerful being from doing exactly what he wants, when he wants, and to whom he wants, lecturing smugly all the while. 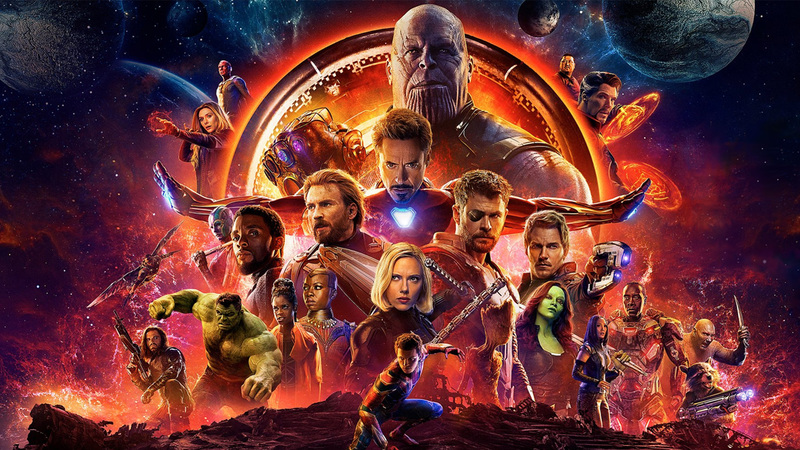 As far as giant casts and action-packed plots are concerned, I'd place Infinity War right behind Civil War, the latter finding just the right balance between introspection and explosions. In Civil War they fight each other, in Infinity War they fight a big purple monster with a groove goatee; I know which I'd rather watch. But, as far as villains go, Thanos is still one of the best Marvel has produced. 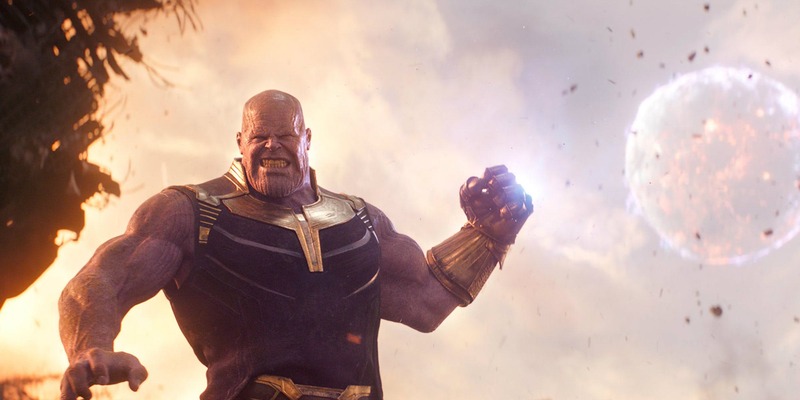 He's powerful, he's layered, Josh Brolin does a great job, I just can't ever get fully behind an omnipotent warlord sending out an army of underlings so that the filmmakers can orchestrate a massive battle. So I guess what I'm saying is that Thanos/his minions/the Outriders were both a positive and a negative in this movie; much cooler than other villains have been, but an unnecessary step back toward Ultron. Wanda lost her accent, Vision was actually Paul Bettany for a minute, Peter Dinklage had an odd cameo; there were a few strange choices that might have kept this film from being perfection, but you have to imagine how incredibly difficult an undertaking melting all of these storylines together must have been. 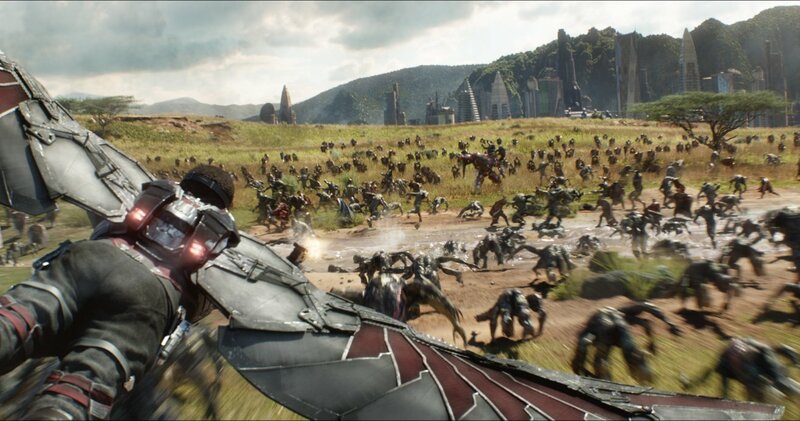 So for these small pieces to be the only real miscues, the Russo Bros. must have worked extremely hard, and in all other ways their effort paid off. Infinity War is simply awesome, and in a definitive sense; there were moments that I was awed. Two immediately come to mind, and I can mention them without adding in any spoilers: when Thor enters the main battle and when Thanos literally uses a moon as a weapon. The action starts right at the beginning, we get no introduction, and really none was needed if you were keeping up with the other movies, so bravo Russos for diving headfirst. Fighting breaks out immediately, but it's not of lot of kung fu, which I really hate, it's more god v. god, sprinkled with the quick thinking from our smarter heroes. Spidey is so cool, I love the way he interacts with Stark, Cap has a beard and a harder edge, Strange is a phenomenal addition, the Guardians add some comedy; what an amazing ensemble, and it worked so smoothly you'd think it wasn't even that hard. Now we come to the ending, which I won't give away, just in case you haven't seen the movie yet, which probably isn't the case. But I will say that I wasn't as impressed as many others, if only because I'm more cynical than average, and because I think the answers to a lot of the problems were painfully obvious if you weren't 100% caught up in the intensity of the climax. Still, I'm not trying to figure out an M. Night movie, I don't want to be that guy, I could be dead wrong, I just wasn't as caught off guard as others seem to be. May of 2019 can't come soon enough, and I'll probably go see Infinity War again very soon; it's a strong addition, the Universe is solid, I'm highly entertained, and I'm ready for more. Order "Avengers: Infinity War" now!